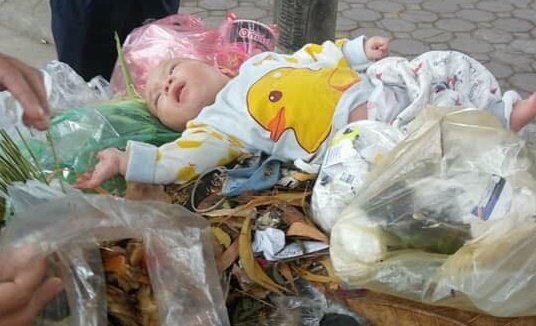 A four-month-old baby has been left in a rubbish bin by his mother after SOS Children's Village in Hanoi refused to take him in. Nguyen Van Sinh, director of SOS Children's Village was quoted by the Vietnamnet Newspaper on Thursday as saying that a woman came to them earlier in the morning and wanted to leave a baby boy there. "We told her we only received orphaned and abandoned children with clear legal papers and backgrounds. We had guided her on how to contract other social service centres and organisations," Sinh said. "However, the woman didn't contact other social centres and put the baby in a rubbish bin about 50 metres from the Village," he continued. "A sanitary worker was shocked upon finding the boy at 9 am. She brought the boy to us again and we accepted him while contacting local authorities for further directions." Nguyen Thi Lanh, owner of a stall selling drinks near SOS Children's Village, said, "I heard the panicked sanitary worker calling me to help her. We saw the baby wasn't sleeping nor crying. I cleaned him. He was very sweet, fully clothed but I didn't find any note left with him. And we brought him to the SOS Children's Village for a health check. Officials from Mai Dich Ward People's Committee were sent out to complete procedures and transfer the baby to the Social Protection Centre 3.